Sagittaria Linn., Sp. Pl. 993. 1753. Gen. Pl. ed. 5. 429. 1754; Hook. f., Fl. Brit. Ind. 6: 561. 1893; Bogin, Mem. N.Y. Bot. Gard. 9 (2): 179-232. 1955; Hartog in Steenis, Fl. Males. ser. l, 5: 327. 1957. Sagittaria sect._Lophiocarpus (Seub.) Hook. f.
Erect, perennial herbs. Leaves petiolate, polymorphic, aerial leaves lanceolate to elliptic-ovate, with sagittate base, submerged leaves modified into ribbon like phyllodes, acute. Inflorescence an erect raceme of 3-flowered verticils, each verticil subtended by 3 subconnate bracts. Flowers unisexual (plants then monoecious or dioecious) or polygamous, male flowers present towards apex of racemes, female or bisexual flowers towards the base, pedicels erect or suberect, recurved & thickened in fruit. Thalamus globular or oblong. Sepals recurved, patent or appressed persistent in fruit. Petals white, occasionally pink or purple-spotted at the base. Stamens 6-many, staminodes mostly present in female flowers. Carpels numerous, spirally borne on the thalamus; ovaries laterally compressed, uniovulate; styles erect, terminal or lateral, stigma papillate. Achenes many, laterally compressed, thin, winged and beaked. A cosmopolitan genus of about 20 species. Sagittaria hirundinacea Blume, = Sagittaria trifolia Linn. Sagittaria leucopetala (Miq.) Bergman = Sagittaria trifolia Linn. Sagittaria sagittifolia sensu Hohen. = Sagittaria trifolia Linn. Sagittaria sagittifolia ssp. leucopetala (Miq.) Hartog = Sagittaria trifolia Linn. 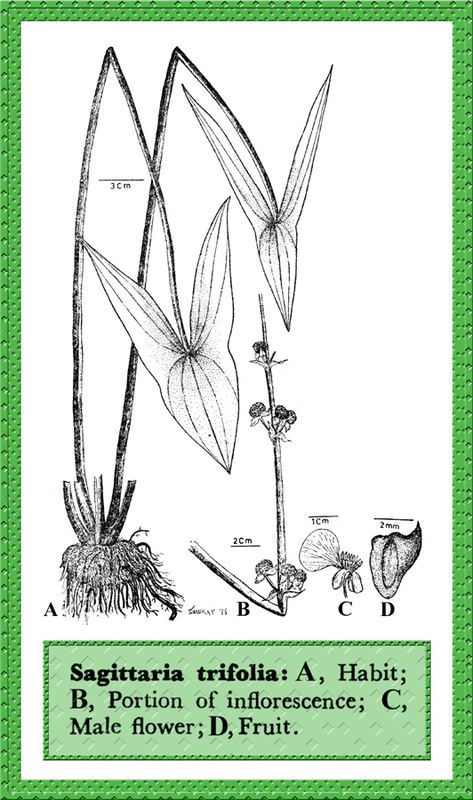 Sagittaria sinensis Sims = Sagittaria trifolia Linn.